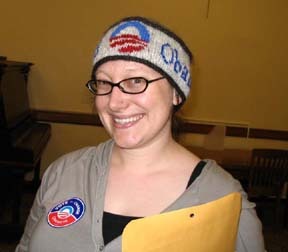 I made this hat for Rose, who has been volunteering tirelessly in her legislative district to help elect Senator Barack Obama president in 2008. Rose led the volunteer effort for the rally at Key Arena in February, has made buttons galore, helped organize a voter registration drive in Oregon, and has helped with phone banking, among much much more. All with a broken foot! Rose is also a knitter. 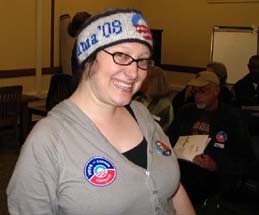 Rose at a Vote for Change voter registration event in her district May 10. 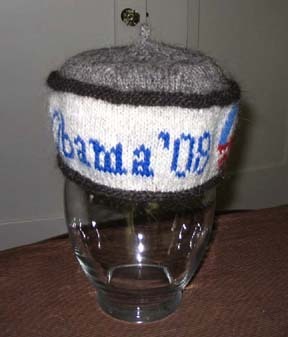 Detail of the hat, with a vase instead of Rose under it. 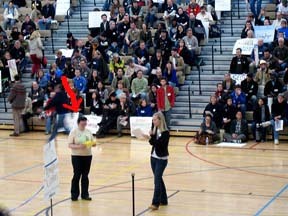 Rose helping with election of Obama delegates at her legislative district caucus.